Review: "Finnr's Cane: Wanderlust" - Sea of Tranquility - The Web Destination for Progressive Music! Wanderlust is the most recent work from this unusual Canadian trio. The members are: The Bard (vocals, guitar and cello), The Peasant on drums and The Slave also playing cello besides keyboards. That's right, no bass but instead two musicians sharing the low frequencies on cello! Prophecy Productions is well known for releasing quality eerie music, and Wanderlust fits very well into that category. 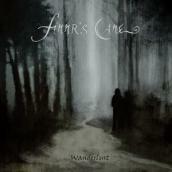 To be more specific, Finnr's Cane could be seen as an atmospheric black metal trio. Not the all furiousness type of, even if a few parts are of that style and speed. Actually, this music is quite melodic in general with lots of ambience. You feel like those dark figures wandering off in the vast Canadian forests on the cover art. I can almost call this album an instrumental album. The vocals are not present on each composition, and you will find long musical breaks everywhere. Then, don't expect upfront rasps either, because you will be disappointed. Most of the times, the vocals are background low clean ones, with a couple of those raspy ones, still discrete mind you. The emphasis is definitely on the music and atmosphere, and very guitar oriented too. The keyboards are not always present and they are never become overwhelming. They are rather well appropriate and just enhancing the overall ambience. Same goes for the cellos, although I wouldn't have mind at all hearing them more often. This album brings together different guitar playing such as: distorted arpeggios/tremolo picking leads, crunchy riffs, clean arpeggios and even a touch of acoustic tonalities. You won't find anything like a bad track on this new album. My personal favorite tune is called: "Glassice"; one great instrumental piece of eeriness. I can just highly recommend Wanderlust to anyone interested in the more atmospheric sphere of underground music.